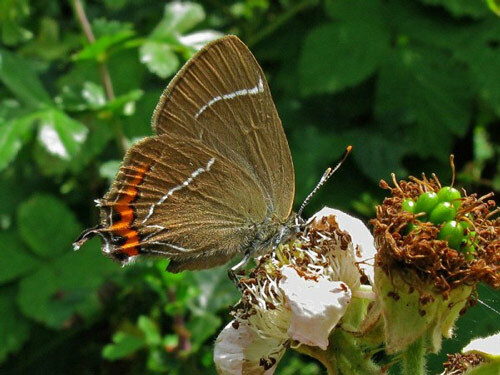 Special features: The white letter hairstreak gets its name from the narrow white line on the underside of the wings which form a "W" shape. These species declined in the 1970's after the caterpillars food plant, elm trees, were hit by Dutch elm disease. The caterpillars are lime green with yellowish chevron markings along the back. Distribution: Found in several areas in England and Wales, but very localised in those areas. Food: Aphid honeydew and Nectar. The caterpillars feed on elm tree leaves. Habitat: Hedgerows and woodland glades, often seen high around the tree canopy.